Help an author – download their free ebook! Free ebooks. Like them, or loathe them? Readers mostly seem to love them. As a reader, I do! Free books can feel like a gift from an author you know and enjoy, and a low risk way to discover new-to-you authors or start reading a new series. And for an author, there can be surprising advantages to either offering a book permanently free or doing a run of free days. Many readers don’t realise just how much them downloading a book offered for free can help the author! Okay, there are also few good reasons for us not to offer books for free. I totally understand why some authors just don’t do it. Most readers (including me!) have far more books than we’ll ever manage to read on our ereaders, and we regularly add more. The huge majority of free downloads are never read. Plus, many authors feel offering books for free devalues their work and encourages readers to expect all books should be free. Some readers even brag about never buying a book, ever. Ouch! Thankfully, not anyone here! The other biggie for authors – those “readers” who make a habit of downloading freebies simply for the fun of leaving a scathing review. Occasionally when I get a really bad review after free days, I click through to see what else that reader has reviewed. Maybe their comments are valid and I need to consider what I can learn from them. Maybe they just don’t read Christian romance. Maybe they enjoy my other books but this one hit the wrong notes for them. I’ve been shocked more than once to find the reviewer has left a long string of 1* reviews, all for books offered for free recently. And nothing but 1* reviews for free ebooks. Double ouch! Despite the risk of bad reviews and the probability that 90% of people who download the freebie may never read it, I love offering my books on short-term free days. I can’t give away all my books, as each book costs at least $500 to produce and launch. But God has told me He wants me giving books away whenever I can. It’s a way to help my readers on a low or fixed income to get some of my books. I know many of my readers are on tight budgets. 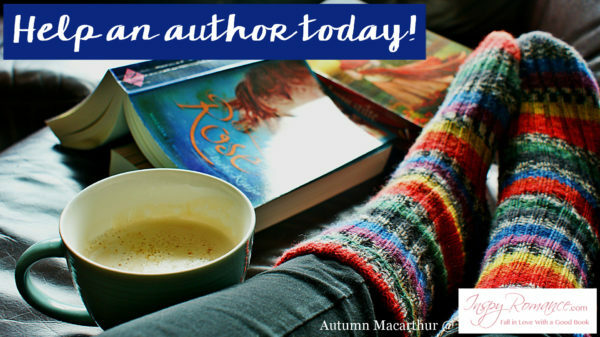 Plus, an author can benefit in so many ways from putting a book on free days! Every free download helps make the book more visible on Amazon, increasing the chances our stories of love and faith will reach new readers. A percentage of the readers who do read the free book and enjoy it, will leave a nice review (thank you, authors love genuine honest reviews!). Another percentage of who read the freebie will go on to get more of the author’s other books (thank you, we love sales and KU borrows too!). Then there’s the wonderful boost to Kindle Unlimited page reads that usually follows some temporary free days. So please, when you see a favorite author has a book on free days or a permanently free book, know you’re helping them reach more readers by downloading it. And if you have KU, don’t feel you’re short-changing authors you want to support by reading a KU borrowed copy of their book rather than purchasing. It all helps! What’s your approach to free ebooks? Are you highly selective, even with books in your favorite genre, or do you tend to download any freebie that looks like something you might enjoy? Have you discovered new authors then bought or borrowed their other books after reading a freebie? I’d love to hear what you think! Not entirely coincidentally (okay, not in the least coincidentally! 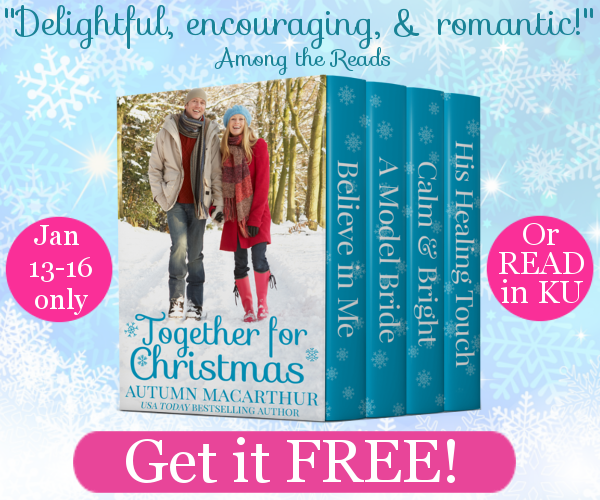 ), Together for Christmas, my four book boxed set, is on free days till midnight on the 16th. If you don’t have a copy, I do hope you’ll download it while it’s free! The free pricing should be available worldwide. If not let me know and I’ll arrange to get a free copy to you. And for more free books you can trust will be genuinely clean and Christian, some of the Inspy authors have permanently free ebooks, posted here. Two other longer-term free ebooks from Inspy authors are Jan Thompson’s Know You More, and Marion Ueckermann’s Dancing in the Rain. Plus, as I mentioned reviews, I want to let you all know I’ll soon be opening my review and launch teams to new members. Book blogger and dear friend Paula Marie will manage a Facebook group, specifically for readers who’d love to do a little extra to support my book launches or sales! To know more, just say so in the comments or reach out to one of us with a Facebook PM. And if you prefer not to use Facebook but enjoy my books and want to join my review team (it can all be done via email), just let me know! I hope the rest of your month is wonderful! Thank you for downloading the free book, Charmaine! And extra thanks for being willing to review. It does help us so much! Hi Autumn, I had no idea how expensive it was to produce and launch a book! That blows me away and gives me a whole new appreciation for authors. Makes me wonder how much Amazon profit from authors…! Hi Wendy! Well, not everyone spends that much. It’s possible to produce a decent book for no charge by swapping services like editing and proofreading with other authors. OTOH, many authors will spend far more. A single cover from one of the well-known designers can cost $500 or upwards. I love free ebooks too, both as an author and a reader! I’ve also found new authors that way. Great post, Autumn! And thanks for the mention of my short story, Dancing in the Rain. Of course, Spring’s Promise is also free but only for new subscribers to my newsletter via my website. Happy to include your story, Marion. And yes, subsciber gifts are a whole other topic in themselves, one I didn’t even think of. How can you not love free books?? I have come to find many a favorite new author by getting a free book, and I am definitely the kind of reader who will go on to purchase the authors other books after when I finish and a writer I like! I am so excited about our next adventure! Me too! Excited, that is. It’s going to be fun and I’m so glad you’re doing it for me! Hi Autumn!Thanks for your informative blog, especially why free books and reviews are so important to author’s standing in the publishing world. I never realized how expensive it was to produce and launch a book. Occasionally when I see a one star review for an author I know, I click through to see what else that reader has reviewed. I have even left comments on the person’s review asking if she even read the book. Since reviews are important to authors, I leave reviews on most books I read. When I first started reading e-books, I was picky on what free books I downloaded. Now in retirement I buy more free books, many of which I do not read – due to time constraint and how many other books I already have from favorite authors in my to read pile. Through free books, I have been introduced to new authors and new genre. My list of favorite or must read authors is always growing. Thanks for sharing. Best wishes. Hi Renate! Your honest and informative reviews are so appreciated by authors! They do make a difference. Amazon’s automated system for recommending books to other readers considers the number of reviews. Plus, reviews help readers find the books they want. Unless I know the author of at least know of them, I’m far less like;y to buy a book with only a few reviews. I only download a free ebook if it’s short (I love novellas that are a prequel to a series) and if I think I’m going to read it. I have bought a number of full length novels after reading a free ebook by the same author. I love free books and have found favorite authors that way. I also love KU. I have bought more books from a series or favorite author. I also look for and request books from the library. Thanks for writing. God bless! All wonderful ways to access books and support an author at the same time, Diana. Thank you! I download many free books. I’m retired and have a lot of free time so I read a LOT of books. There’s no way I could afford to buy all the books I read. I make use of my local library, especially ebooks on Libraries Unbound and Hoopla. When I see a free ebook available online that I might enjoy, I download it. I may or may not read it but if I download it, the option is there. I’ve discovered many great authors this way and later purchased books by them. I don’t always leave reviews for the books I read. I don’t like to repeat the same things in my reviews but have a hard time coming up with things to say. So I have to admit sometimes I just skip it. I always rate them on GoodReads though. Hi Sherri! Lovely to have time to read and so many options for free or low-cost books. I hear you on not wanting to repeat yourself in reviews, though short simple reviews are totally fine. And rating on Goodreads helps, too! But, it has led me to be a regular reader and buyer of what were once new to me authors. Nice to read the author’s perspective. Thank you for downloading free books, Amy. LOL, I would guess I have a lifetime’s worth of reading on my Kindle. But often when I’m looking for something to read I’ll scroll back to find a freebie I downloaded months or even years before! Thank so much, Amy! Me too, on finding new authors and going on to buy their other books. And I might just beat you on the free ebook count! Goodreads ratings definitely help. Only two drawbacks of being an author. Less reading time because of writing stuff, and not being able to review the books I read on Amazon. I must get better at using the BookBub recommendations! Hi, Autumn! Thanks for this post about free books, I have often wondered how and why authors do this. I don’t download all free books I see. I read the story description to see if it sounds interesting to me. I have also then purchased more from that author. I used to have Kindle Unlimited but had to cut that expense for now. I try to leave good reviews but I don’t review every book I read. I like the 99 cent specials on single books and the multi book sets also. I have found new authors which I love through the free books. That is how I found you! ☺ My favorite so far is the series set in the London department store. Praying you and hubby will have good health in this New Year and that God will continue to bless your writing. Thank you for both downloading books and reviewing, Doris! I hope to write another book for the Love in store series soon. I still have plenty more ideas set there, the only issue is writing time. And I write slowly, so can’t do almost as many books as I’d like too. More books this year, God willing! Thank you for being so honest, I love that. I knew downloading the free books was helpful but I have so many on my kindle account and honestly prefer paper! But, I did download yours and will eventually read them. A good clean read is such a great escape from this crazy world. Thank you for what you write! Bless you and your writing. Thank you, Dalyn! I appreciate your comment and hope you enjoy the stories. I love my Kindle Fire, but I also find reading on paper a very different and more enjoyable experience. Because there’s often a big cost difference I buy a lot of ebooks. Also, we live in a tiny house and there’s no space to squeeze in another bookcase. Seven, at last count! I download many freebies and have found some favorite authors that way. I love your books and always leave reviews. Thank you very much for the wonderful Christian books. You are on my favorite authors list. Thank so much, Virginia. I’m honored and blessed by your comment! Thanks for letting us know we’re still helping by snapping up free books when they’re offered by our favorite authors. I’m another who doesn’t spend much when it comes to kindle books. I try to get them free, or when they’re on sale for 99¢. However…that’s because if I really like the author, I’m most likely going to end up buying their print books instead. I have found new favorite authors this way. In fact, I think all my current favorites were discovered through free books. I do have a ton of books on my kindle, but that’s because I download what love oks interesting st the time and then get around to reading them when I’m in the mood for that sort of book. Sounds like your approach to free ebooks is like mine, Joanne. I download what looks interesting when it’s free, and I’ve gone back months or even over a year to read a the book. I tend to only buy books from authors I know and have read before. 99c is a big encouragement to buy, but for authors I love, I pay more. Thanks for this very interesting and informative post! When I got my first e-reader, I was getting ready for heart surgery and had realized holding up a paperback book while laying on my back was going to be tedious. I filled it with freebies, and that’s how I met most of the authors here on InspyRomance! So I am a big fan of freebies, and I’ve ended up buying lots of those authors other books (although sometimes I wait until they’re on sale). Well, breakfast is almost ready, so I’ve got to quit rambling on about books :-) Thanks for writing!! I hope you had a lovely breakfast, Margaret! And glad you were able to find the rest of the series. With ebooks, they do get unpublished for all sorts of reasons. Paperbacks have a longer life. Because I live in the UK and some publishers don’t make all their book available here, it can get tricky. Before Harlequin closed Heartsong Presents, I had that problem. Same here on going back a long time after downloading it to read a book. I have so many books on my Kindle I haven’t read. But they’re patient, waiting for their “Someday” to arrive. I usually get the free books if it looks like something I might enjoy reading some day, even though I have a gazillion other books waiting for me to read. I always get them when it’s an author I know and love, even if I’ve already read the book. I figure it will help out the author, and it’s good to know that it really does. Thanks for the informative post! It definitely helps the author, Winnie! Thank you! I love free ebooks. It gives me an opportunity to be introduced to new authors and many times I will order other books by the author. Happy reading, Kerri! I hope you enjoy Together for Christmas, too! My family has been in a family crisis for the past several years. So I haven’t felt I had the money to buy new books. I used the library or re-read all my old favorites. Once I figured out how to get the free Kindle reader on my phone, I’ve been downloading freebies left and right! ;) I’ve bought a few books (ever more than $1.99), but mostly I just stuck to the freebies and to giveaways. I also signed up to be an early reviewer on my blog, so I get even more freebies. :) However, I have downloaded more than I can read, so I have restricted myself to only freebies from authors I’ve already heard of or that come highly recommended in my Goodreads group of Christian fiction readers. There were several Christian authors who would put their freebies in group giveaways with a bunch of clean romance authors, and I would download all of them. But the few clean romances I read were all sub-par or could so easily have had such a spiritual lesson that I was disappointed. I always try to leave a review of some kind on every book I read, but I do have high standards for my Christian fiction. I wrote about 25 5-star reviews out of the 120 books I read last year. I used to give 1-star reviews easily, but I have since tried to find something nice to say, even though I do believe that reviews are my opinion, and I’m entitled to my opinion if I didn’t like it. But I always say why. Hugs on the family crisis, Lila, Praying for you and your family. It’s wonderful that we can download so many free books and turn phones, tablets, or laptops into ereaders! To be most helpful to other readers, lower-starred reviews do need that rationale for why. I’m glad you always include that. And I hear you on all the sweet and clean romances, many with none or minimal faith content, being in the Christian category on Amazon. The authors do it for a reason- it gives them an advantage in ranking. But it makes things tougher both for Christian authors and readers who want genuine faith content in their reading. I hate when I see people leaving a bad review, especially for a book that I really liked. I really do think there are people who leave bad reviews just for fun. There used to be a button saying the review was not helpful, and I would click on that. I love the free books, but I love it more to be able to buy the book and feel like I am supporting the author, especially my favorite authors. I don’t try every free book, but I have found an author I want to read more of their books, all because of the first free one. Hi Becky! Sadly, there are people who give bad reviews just for the fun of it. :( The good thing is that they don’t usually say much about WHY they didn’t like the book. So though it pulls the book’s review score down, hopefully it won’t put off other readers. Hello, Autumn! Thank you so much for offering your wonderful set for free! I loved books in that set. As a reader, I like downloading free books, though I’m more selective now. As an author, I can so related to everything you’ve said! Yes, I’ve become more selective now, as well. When I got my first KIndle I went a little crazy and downloaded a load of freebies. But I now choose more carefully, even with free. But I’m a lot more willing to take a chance on a free book! Thank you Autumn <3 I'm becoming more selective with the free books as well, like Alexa said. Hi Natalya! Agreed, it’s far too easy to fill our Kindles with books we’ll never read. I’f you chose to download mine, I hope you enjoy it! I own and have read all four books in this boxed set, which are really great, by the way, so I don’t feel like I need a repeat, but encourage people to get it. Like many people here, I’ve downloaded my fair share of free books, just because they were free, then I’ve started to be a lot more selective and read several reviews.. and *if* I like the story, I might download a free books. If I know the author (and like him/her), then I’ll just download sometimes without even reading the blurb… But I’ve definitely discovered new authors by reading their free books.. and have classified then in all sorts of levels in my love – hate piles (aka, kindle collections). Thank you for your kind words about the books in the set, Priscila. I chuckled at you having love/hate piles in your KIndle! Hi, Jessica! I will always download a free book from one of the Inspy authors without reading the blurb or reviews, too. To support my author colleagues, and because I know what the quality and content of the book is likely to be. Thanks for reading The wedding List. :) So glad you’re enjoying it! i do like to download the freebies as well. i think it is good to support authors and then if i like the friebee it might inspire me to pay for other books by them. i dont do facebook much but would be interested in reviewing. i dont know if this the place to put it on but just thought i would say it.